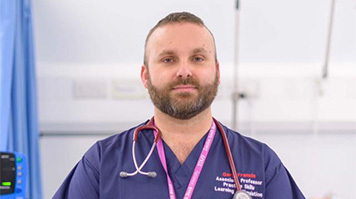 Gary Francis, LSBU’s Associate Professor of Practice Skills Learning and Simulation in the School of Health and Social Care (HSC) made it into the prestigious finals of this year’s Student Nursing Times Awards, in the Teaching Innovation of the Year category. Although Gary's team's entry did not win this year, their efforts were recognised and highly commended. Gary was nominated for his outstanding work running LSBU's clinical skills peer tutor programme, which is a peer-led initiative providing support to health and social care students in the development of their clinical skills. The programme aims to provide a safe facilitative space for students in which they can practice skills and ask discreet questions. In providing this support to fellow students peer tutors also gain invaluable skills and are able to develop themselves. The Student Nursing Times Awards celebrates the very best in nurse education, recognises and rewards brilliant educational establishments and honours those who are committed to developing new nursing talent as mentors, lecturers and providers of placements. The awards also pay tribute to students who have demonstrated the academic achievement, clinical prowess and personal qualities that will make them brilliant nurses. More than 400 talented student nurses, education providers and mentors entered this year’s awards. Gary said: "People are often concerned to let peers support each other especially in regard to clinical skills, worried they might get it wrong and potentially endanger patients as a result. Our programme works with the peer tutors intensively, providing them with additional skills training to ensure they emerge confident and competent. Then we focus on providing teaching, facilitation, support, communication and feedback training to enable them to organise their sessions and support the students' practice. Warren Turner, LSBU’s Dean of the School of HSC, said: “I was thrilled to hear that Gary and our student peer tutors made it to the finals of this year’s Student Nursing Times Awards. Although their entry did not win this year, it was highly commended. Gary is a real asset to LSBU’s School of Health and Social Care. Both his teaching and research are an example of excellent innovation in nurse education." After presenting to members of the 34-strong panel of esteemed educational professionals, winners were announced on 27 April 2017 at the London Hilton on Park Lane where over 650 nurse education professionals, student nurses and nurse leaders gathered to reward the students and establishments shaping the future of nursing. Read about Gary's previous Florence Nightingale Travel Scholarship award.